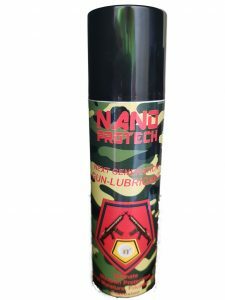 Nanoprotech Next Generation Gun Lubricant 120ml. Military tested and underwritten as the best Weapon protection yet in the world. Hydrophobic protection against friction, wear, corrosion and carbon build-up. Apply onto all working components within your gun or rifle for ultimate protection and lubrication. Nanoprotech Next Generation Gun Lubricant will protect your weapon for thousands of firing cycles.